Jonathan D. Rodriguez | Attorney | Alvarez, Winthrop, Thompson & Storey, P.A. 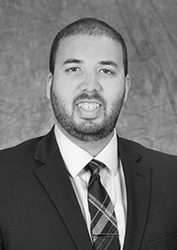 Jonathan D. Rodriguez is an associate with Alvarez, Winthrop, Thompson & Storey, P.A. His practice is focused on business litigation, first-party property insurance defense/homeowners claims, community association disputes, construction defect and premises liability. Mr. Rodriguez is a native son of Florida having been born in the city of Hialeah and spent his childhood in the Miami / Ft. Lauderdale area. Mr. Rodriguez earned his Bachelor’s Degree in History with a minor in Legal Studies from the University of Central Florida in 2013. He went on to earn his Juris Doctor from Florida International University College of Law in 2016. During Law School, he had the pleasure of interning with the United States Coast Guard Judge Advocate General Corps, District 7’s Legal where he observed and participated in Military Court Martials involving cases ranging from drug smuggling, environmental crimes, and piracy on the high seas. He then had the honor of a judicial Internship with the Hon. Robert J. Luck in the 11th Judicial Circuit, Felony Criminal Division. Prior to joining the law firm of Alvarez, Winthrop, Thompson & Storey, P.A, Mr. Rodriguez was an Assistant State Attorney with the Miami-Dade Office of the State Attorney. During his time with the State Attorney’s Office, Mr. Rodriguez prosecuted a wide range of cases from criminal misdemeanors, traffic crimes, DUIs, and Traffic Fatalities. Appearing before and practicing in front of almost a dozen judges, Mr. Rodriguez has an understanding of the potential extremes an experience in court may entail. Mr. Rodriguez brings a unique perspective to civil practice and his time spent at the State Attorney’s office has instilled in him a diligent work ethic, zeal for advocacy, and hundreds of hours of in-court experience. Mr. Rodriguez is committed to using his experience and unique approach to tirelessly advocate on behalf of his clients.